1 In small bowl, combine Hellmann's® or Best Foods® Real Mayonnaise, cheese, basil, vinegar and garlic. Reserve 1/4 cup. 2 On skewers, thread sausage. On separate skewers, alternately thread red peppers and onion. Grill or broil sausage and vegetables, brushing vegetables with remaining mayonnaise mixture, until sausage is done and vegetables are tender. 3 Meanwhile, brush reserved mayonnaise mixture on both sides of rolls. Grill or broil, turning once, until toasted. 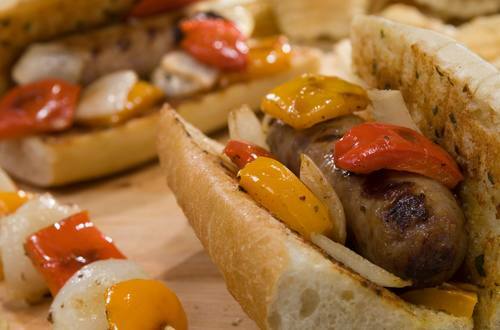 To serve, arrange cooked sausage and vegetable skewers on grilled rolls; remove skewers.